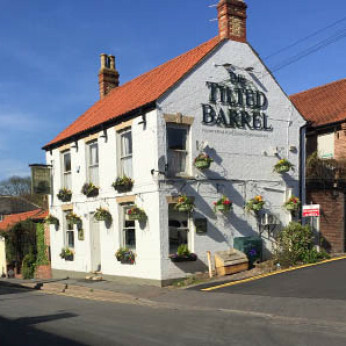 The Tilted Barrel is a friendly, family oriented village pub set in Waltham in Grimsby. We offer a range of draught beers and real ales as well as soft drinks to suit whatever may take your fancy. There is plenty on offer for the whole family to enjoy with live music, pool, quizzes, darts and much more! Come in today and let our friendly staff take care of you. No matter whether you're looking for a full family meal after a long day or just want a small bite to eat at lunch time we have just what you're looking for. With our large menu you are sure to find something to tickle your taste buds and you can be reassured that all of our food is cooked freshly on the premises the very same day it is ordered. With rustic, old-fashioned pub meals available as well as lighter options too, we can accommodate any appetite. So stop in to the Tilted Barrel restaurant today for a meal and take advantage of our fine wines, teas and coffees before taking the time to relax in our friendly pub after you've enjoyed your meal. On Sunday's we also offer Traditional English Roast dinners and throw a BBQ on our outdoor patio so don't miss out, get yourself along to the Tilted Barrel.